Heavy duty automatic sliding doors are tough doors that can be used for heavy applications. SP-380 is engineered to accommodate the extremes of automatic door weights. This system is design with the notion of extreme performance. Utilizing sophisticated SP-280 electronics, its powerful purpose built 120W motor and steel gearbox provides high torque and infinite control over heaviest doors. It has strengthened components which are designed to cope with the stresses placed on the door from the use of heavy door leaves. 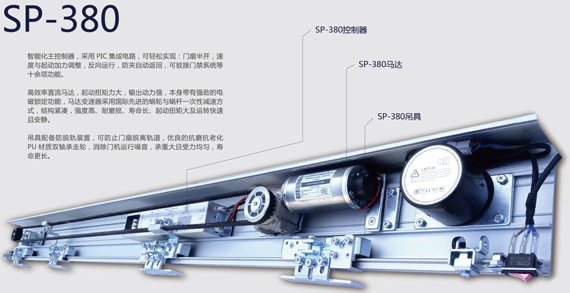 SP-380 is not designed to move heavy door leafs at lighting fast speeds, instead it is developed to be safe and sensitive, while taking away the need to move heavy door leafs manually. The SP-380 automatic door operator is a proven performer for industrial and commercial applications. It can be used in airports, shopping centre’s loading section, supermarkets, hotels, hospitals, sports stadiums, factories, warehouses and many other industrial and commercial sites that require a solution to the extremes of automatic door control. Did you know...? SPACE can help you with your projects and offer personalised solutions? View online guides and technical brochures!